You've spent time engaging on social networks and tastefully promoting your content and offers. You've segmented your lists and developed a regular monthly email. You know from 10 Visual Reasons for Pursuing Inbound Marketing that you can expect more traffic, leads, and conversions over time. 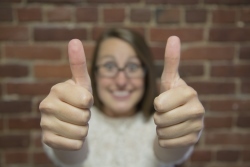 What should all of that inbound marketing success look like? Here are 11 signs to look for based on inbound marketing success stories I've been involved with. When I first published this article in 2013, all eleven signs referred to one specific success story: a website relaunched on 6/30/12. Blog articles: published 8x per month from launch through December, and 6x per month after that. Offers: 9 created over 15 months ranging from downloading an ebook or brochure to applying for a job and subscribing to a newsletter. A monthly newsletter: launched in August. Monthly videos: produced, uploaded to YouTube, promoted on the blog and referred to on the website. Ongoing social interactions: on Twitter, Facebook, and Pinterest. Ongoing social interactions on Facebook, Twitter and Google Plus. Republished articles with updated content. As a result of these inbound marketing activities, the following success signs took place. Assuming similar inbound marketing activities, you can expect to observe the same signs. Inbound Marketing Success #1. 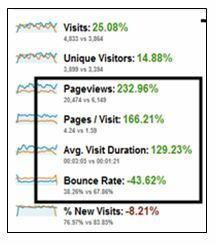 See blog traffic increase. The chart below comes from Google Analytics and shows pageviews associated with the blog for the first example. These started at 0 on 6/30/12 and reached 15,730 by August 2013. For the second more recent example, you see traffic growth from site launch in early 2016 to end of January 2018. Note that this is overall sessions, not just those associated with blog articles as you see above. However, the blog is a major driver of traffic. Inbound Marketing Success #2. See good website traffic increase. Note the word 'good.' Quality matters even when it comes to growing web traffic. You want 'good' traffic, in other words, relevant and qualified traffic. Look below to #7, and you'll learn about another important benefit and sign of inbound marketing success. In the meantime, the chart immediately below shows the increase over time in website traffic. The green represents organic traffic (i.e., traffic from people who start exploring on Google or Bing search). The blue is direct traffic (i.e., traffic from people who type your website address directly into the web browser window). 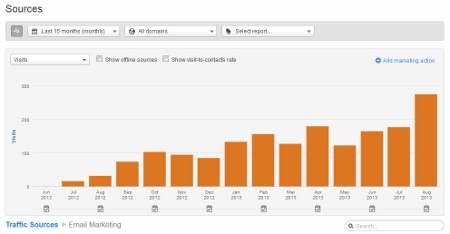 The chart below highlights website traffic generated only from the monthly newsletters. From an organic traffic perspective, the dynamics of the newer example are similar. However, in this case referrals and social traffic although not as significant in volume as the organic traffic represent important sources of new leads to the site. Each website has different dynamics, however if your content is of consistently high quality, and relevant to your business personas or prospects, you can expect similar organic results. Over time, as you consistently and regularly publish content that supports your keyword and topic cluster strategy, you'll notice organic traffic growth. What's important here is seeing non-brand and non-company terms grow. It's important because those who search on non-company terms are ones who haven't yet had the opportunity to meet you. These are truly new prospects for your business. With content marketing becoming more competitive, it's important - if you are committed to pursuing inbound marketing - to take keyword topics research seriously so you can develop content topic clusters, write pillar content and supporting blog articles that are authoritative and complete. Inbound Marketing Success #4. See search terms broaden beyond your brand and company name. Back when we worked on the first example, Google still graciously provided information on organic search terms. As a result, it was easy to monitor the increase in traffic generated by non-branded or company keywords. Those days are gone. However, it's still possible to determine success based on how specific blog articles and blog article topics resonate (i.e., how much traffic do they generate) and checking with third-party tools to monitor your progress based on the research you've done and the topic clusters you develop. Your goal is to connect with people who've never heard of your company before, and discover you as a result of your brilliantly helpful content. Inbound Marketing Success #5. See conversions happen! This is the fun part! Once you start generating traffic to your site, you'll notice people signing up for your content, downloading ebooks and offers (and sharing an email address with you!). Some may forward comments and questions to you. It's exhilarating! In the chart below, you'll see conversion rates associated with those offers described above. An overall 20.1% conversion rate on landing pages is pretty exciting! You'll discover that conversion rates vary depending on where in the purchase process your offers fall. For example, an offer at the top of process (aka funnel) when someone is in discovery mode will generate a higher conversion rate that will a free consultation that assumes interest in making a purchase decision. That's why it's important to have several different types of offers available. Not everyone comes to your website (or your office or showroom) ready to buy. So have something available that allows them to get to know you over time. Offer ideas include checklists, newsletter signups, ebooks, and other relevant information. Inbound Marketing Success #6. Look for engagement! 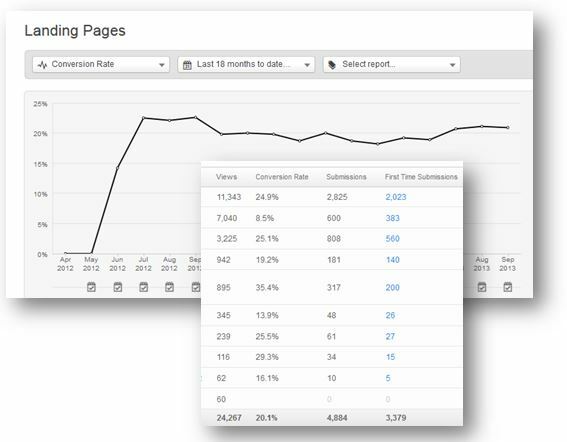 In Google Analytics, that translates to a lower bounce rate, increased pageviews and more time spent on your website because visitors are engaged in the content you have. The ultimate engagement is someone who not only signs up to hear from you, but who also explores your website, laughs at your jokes on Facebook and interacts with your emails. In addition to monitoring signups and downloads, look at your email stats (opens and clicks) and social data. Note that blog articles tend to generate higher bounce rates than do regular product or ecommerce pages. Inbound Marketing Success #7. Start noticing patterns and pinpoint unexpected situations. As you develop more data, you'll start to notice patterns. For example, which topics generate the most interest, the most conversions or even the most interactions. You also start to notice anomalies and situations you don't like and need to address and fix. In the case pictured below, the pattern had to do with bad traffic! A referral source was sending poorly qualified traffic. Although the increase in website traffic was dizzyingly exciting, we quickly realized that these visits weren't doing us any favors! We contacted the referral source to change the link. Over time, you'll notice patterns in offer conversion rates and will be able to determine which offers generate more conversions, which ones resonate with different personas, and which ones make sense based on where your visitors are in their purchase cycle. Inbound Marketing Success #8. Increased sales or customers. Whatever your bottom of the funnel offer - check out the retailer locator, register for a demo or trial, call to speak with a sales rep - you will notice more. Other related increases: more pointed comments, responses via email that what you're doing is helping to drive sales, requests to be included in your locator, etc. It can lead to more hiring submissions, or a decrease in customer service calls and complaints because your website content immediately answers customer questions. You'll also notice more high-quality comments to your blog articles. We've been using those as fodder for new blog articles. Pay attention to all customer touchpoints. You will learn a lot from them, including how to develop lead scoring rules based on what content leads to conversions. Inbound Marketing Success #9. It takes less time than usual for a contact to become a customer. This is harder to demonstrate to you visually. However, because your website content does such a good job anticipating customer (and persona) questions when prospects speak to you live, they are far more qualified and ready to commit to doing business with you! If you've successfully increased traffic, increased the number of leads on your site and don't see more customers, step back and look for patterns. Maybe you have a major disconnect in your value proposition and content. Fix it. Inbound Marketing Success. Lots of kudos! You'll start to notice that your entire organization will share positive feedback with you about blog articles, newsletters, and offers. They'll mention how valuable the website content is for helping them close deals. They will willingly want to become Brand Ambassadors and help tell your company story. Contacts outside of your organization will do the same. You'll notice them lurking on your site and regularly referring to your product and service resources because they answer customer questions. Inbound Marketing Success. You get smarter about the overall sales process! Absolutely! By virtue of paying attention to the dynamics of your website and content, you begin to form assumptions and hypotheses about how your content will resonate with specific audiences. You get into the habit of testing new ideas to gather data and make improvements, including sales. In other words, you become a complete and total inbound marketer who thinks holistically about sales and marketing (i.e., smarketing). What other signs of inbound marketing success would you add to this list? Note: This articles was originally published on September 26, 2013 and has been updated.